14.6 PPG, 7.4 RPG, 2.9 APG, and 2.0 TOPG on 47.6/39.8/83.3 splits. 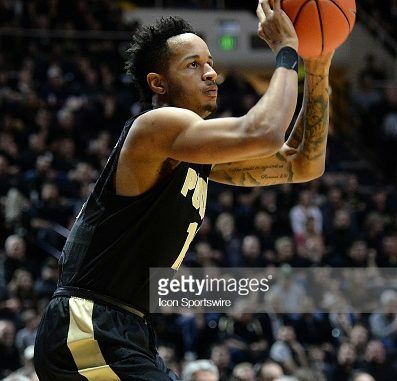 Vince Edwards profiles as a second round prospect due to his high floor, but low ceiling. Edwards improved as a senior on most statistical categories, or at least stayed the same. His stock has improved by returning the school, as he was likely to be a very late second round pick in 2017, but now is likely to go as early as 35. He’s easy to run plays for off of screens and he moves well off ball. Combine that with his versatile and effective defense, he’s got the makings for a successful NBA role player. NBA Comparison/role: floor of 2017-18 Al-Farouq Aminu; ceiling of Robert Covington; role is likely being a 3&D player that can play SG,SF, PF and rack up rebounds. The Mavericks would be fortunate to draft Vincent Edwards. He could contribute right away and could compliment both Dorian Finney-Smith and Doug McDermott off the bench. Edwards is a high IQ shooter that can be a plus on the defensive end, which could fit well with with the defensive minded Dorian Finney-Smith and the shooter Doug McDermott. Edwards is a low-risk player with low reward, which makes perfect sense for the Mavericks as drafting Edwards would fill a need of defense, length, shooting, and wing depth. While the athleticism hole wouldn’t be addressed by this addition, Carlisle has worked well with a lack of athleticism and made it work in the past. Vincent Edwards could fit with virtually any team due to his flexible role. Additionally, depending on the route of the first round selection, Edwards could compliment the other rookie(s).